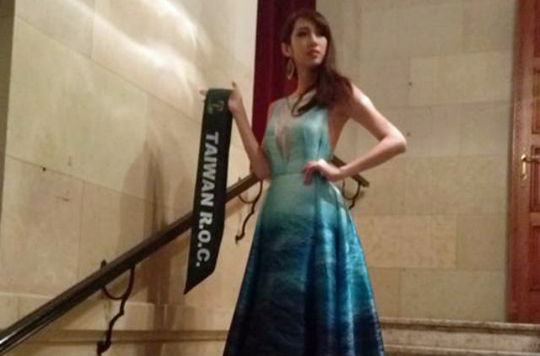 Taiwan's representative at Miss Earth 2015 says she has been kicked out of the pageant for refusing to wear a sash that reads "Miss Chinese Taipei" instead of the "Miss Taiwan ROC" that she is now currently wearing. In a Facebook post published earlier today, 22-year-old Ting Wen-yin revealed that she had been warned before she made her way to Vienna, where the pageant was being held, of the possibility of political pressure from China. "I told them 30,000 times that Taiwan is Taiwan," a defiant Ting wrote. "I was born in Taiwan, my sash now says Taiwan, I represent Taiwan, and I'm going to use the name of Taiwan in appearing at this pageant." "Their response to me was, 'change your sash or just leave'. Today, they did not allow me to stand on stage and photographers were not allowed to take my pictures." Ting is however not too beat up about leaving the competition behind. In her Facebook post, she told her fans not to be taken in by the glamorous images coming out from the pageant. Organisers failed to provide lunch for contestants on two occasions, nor the time to buy their own lunch, she complained. Dinner was either some bread or some rather unappetising pasta with tomato sauce. "Over the last three nights, we were shuffled from nightclub to nightclub, wearing beautiful clothes to talk and dance with men. I felt like a club hostess," she fumed. "So it might be a blessing in disguise that I'm out of this contest. We paid large sums of money to enter the contest, but we're treated little better than prisoners." Since the inception of the pageant in 2001, Taiwan's contestant has been represented as "Miss Taiwan R.O.C". In 2007 it became the first international beauty pageant to host delegates from China, Hong Kong, Macau, Taiwan and Tibet, despite the political sensitivities. The blowback came swiftly though as the delegate from Tibet was made to wear a sash reading "Miss Tibet-China." That was to be the last year a Miss Tibet was present at the pageant. In recent years, Miss Hong Kong and Miss Macau have also disappeared altogether from the competition. Hopefuls from across the straits have represented their territory under various different guises over the past few decades. Throughout the 1990s, Taiwan was represented at major international pageants, including Miss World and Miss Tourism, as "Miss China." At Miss Universe, Taiwan's contestant wore the sash, "Miss Taiwan, R.O.C." up until the early 2000s. The watershed moment appears to have been in 2003, when the island's representative, Beverly Chen, succumbed to pressure and put on the "Miss Chinese Taipei" sash. Chen told journalists tearfully at a press conference at the time that she was given two sashes by pageant organisers, one reading "Miss Taiwan" and the other "Chinese Taipei." "I was told to wear the Chinese Taipei one in front of the media. The Miss Taiwan one was only for occasions where the media were absent." Shocked and humiliated by the treatment, Chen says she was taken aback as Panama was one of few countries in the world that had full diplomatic relations with Taiwan. In another recent landmark case highlighting the treacherous waters of politics in international beauty pageants,Miss World Canada, Anastasia Lin, says she has been blocked by Chinese authorities from the Miss World pageant. The Hunan-born beauty queen who is also a human rights advocate and Falun Gong practitioner, also claims that her father, who is now still living in China, has been on the receiving end of threats from Chinese security agents because of her human rights advocacy.